Acme Roof Systems offers reliable industrial roofing for businesses, schools, warehouses and other buildings in the DFW Metroplex. Our team of roofing experts can help you determine the type of industrial roof your building needs based on certain factors, such as the size of your building, the slope of your building’s roof deck, and your budget. We offer industrial roofing systems made with high-quality materials that are designed to endure the Texas harsh temperatures, severe weather, and sunlight exposure. We have your best interest at heart and want to ensure that your building interior is protected from potential hazards. Contact us for a free estimate. These systems are designed to help keep building interiors cooler by reflecting sunlight rather than absorbing it. This quality, known as solar reflectance, keeps the roof temperature cooler, which results in cooler indoor temperatures. These lower temperatures help reduce air conditioning bills, which helps companies in the DFW area save a considerable amount of money. If you’re concerned about aesthetics, know that cool roof systems don’t have to be white or a light color – these roofs available in darker shades as well. Our DFW roofing experts can help you choose the right cool roof system for your building. TPO (Thermoplastic Polyolefin) industrial roofs use specialized technology to combine ethylene, propylene, and rubber. This combination, along with fiberglass and other fillers, create a roof that is highly durable. 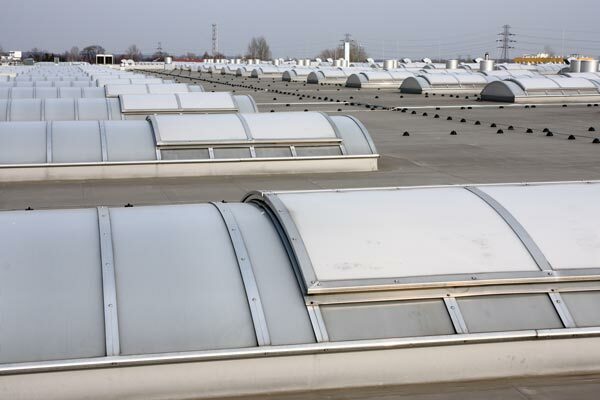 TPO roofs for industrial buildings are cost-effective compared to other types of roofing materials. They also offer several other advantages, such as being resistant to dirt, bacteria, UV ray damage, eco-friendly, and protection from chemical exposure. If you decide on a TPO roof, our team at Acme Roof Systems will guide you through your options and help you select the most suitable type of TPO roofing for your building. Modified bitumen roofs are typically designed for industrial or commercial buildings that have a roof with a low slope. The bitumen in these roofs is combined with other materials, such as fiberglass, to make it more durable. Modified bitumen roofs also offer other important benefits, such as being able to withstand severe weather conditions, being easy to repair and being flexible enough to reduce the risk of cracks and other flaws that can occur due to temperature changes. Multi-family buildings, such as apartment buildings and condominiums, require special considerations when it comes to choosing a roof system. The roof you choose needs to be as durable as possible to reduce the risk of wear and tear. When roofs on multi-family buildings deteriorate, this can lead to several problems that affect tenants, such as leaks, increased noise, damage to tenants’ personal property and drafty conditions in the building’s interior. Acme Roof Systems can help you choose a strong and durable roof for your multi-family building in the DFW Metroplex, so you can reduce your costs and your tenants’ discomfort. Contact Acme today!